A scientific article published by the British Journal of Urology International stated that an estimated 2.3 billion individuals across the world will be affected by at least one of the lower urinary tract symptoms (LUTS) by 2020. Around 423 million of these will suffer from urinary incontinence (UI), 546 million from overactive bladder (OAB), and 1.1 billion from LUTS/bladder outlet obstruction. This large number of patients suffering from urological dysfunctions will require effective diagnostic solutions for receiving an efficient treatment regimen. Therefore, the bladder scanners market is projected to gradually expand due to the rise in urological disease prone geriatric population and increase in incidence of urological disorders. The global bladder scanners market was valued at US$ 126.0 million in 2017 and is expected to reach US$ 210.0 Mn by 2026, expanding at a CAGR of 5.8% from 2018 to 2026. Major factor driving the bladder scanners market is increase in incidence of urology related disorders such as lower urinary tract obstruction, urinary incontinence, and other urinary tract infections. However, factors such as unfavorable reimbursement policies and rise in the number of catheter-associated urinary tract infections is likely to restrain the market. The global bladder scanners market has been segmented based on product, application, end-user, and region. In terms of product, the portable bladder scanners segment held major market share in 2017 and the trend is projected to continue during the forecast period. Based on application, the urology segment is anticipated to dominate the global market from 2018 to 2026. In terms of end-user, the hospitals & clinics segment is likely to lead the global bladder scanners market during the forecast period. 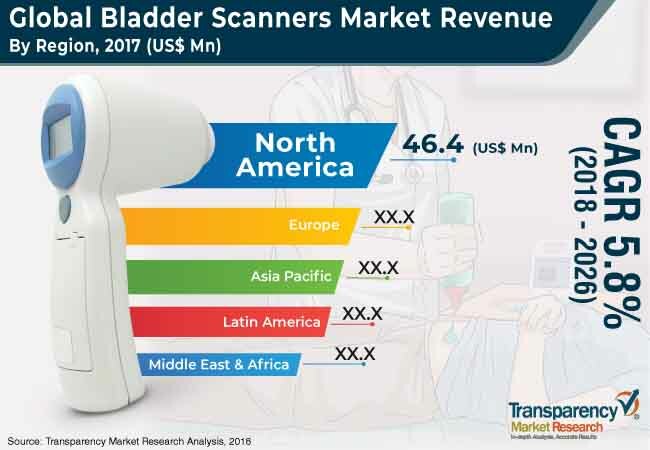 Geographically, North America dominated the global bladder scanners market in 2017, accounting for the largest market share. North America was the largest market for bladder scanners due to the high adoption rate of ultrasound bladder scanners among urologists and urogynecologists and presence of large number of testing centers across the region. Moreover, increase in incidence of urological dysfunction and advancements in urodynamics capital equipment are the other factors driving the bladder scanners market in North America. Asia Pacific held the second largest market share in 2017. The region is expected to expand at a high CAGR from 2018 to 2026. Factors such as increase in incidence of urinary incontinence, stress incontinence, and lower urinary tract symptoms (LUTS), and rise in disposable income of the population contribute to the growth of the market in Asia Pacific. Additionally, surge in public health initiatives drives demand for urodynamics equipment in the region. However, unfavorable reimbursement policies and negative perception about urodynamics studies is likely to hamper the growth of the bladder scanners market in Asia Pacific. Key players operating in the global bladder scanners market include C. R. Bard, Inc., Verathon, Inc., dBMEDx, Inc., Vitacon, LABORIE, MCube Technology Co., Ltd., Caresono Technology Co., Ltd., MEDA Co., Ltd., Mianyang Meike Electronic Equipment Co., Ltd., and Signostics Ltd.